I started taking Japanese language classes as a college freshman in 2002, and I will begrudgingly admit that, almost ten years later, I’m still not entirely fluent in the language. True linguistic fluency is almost infinitely multifaceted and difficult to attain in any foreign language, especially when that foreign language is not regularly spoken in one’s everyday environment. The best way to attain a high proficiency in Japanese is to move to Japan and live there for an extended period of time. Nothing that I can suggest here can serve as a substitute for actually going abroad and living one’s life in Japanese, so the best advice I can possibly give is – go! Figure out how your school or employer can help fund your sojourn, apply for a passport, and go! In the meantime, however, you don’t even need to leave your bedroom in order to start reading Japanese. Most Japanese language curricula focus on giving students the tools they need in order to read nonfiction texts such as newspapers, essays, and academic articles. Of course this type of instruction is useful, but a sentence like “the economy suffered a sudden downturn in the fourth quarter” requires a different set of linguistic skills than a sentence like “the stars shone brightly in the sky,” especially in Japanese. It’s therefore up to many language learners to figure out how to read Japanese fiction on their own. What follows is a guide for students of the Japanese language who want to start reading literature – whatever their definition of “literature” may be – in Japanese. In this essay I will detail the necessary linguistic foundations before discussing useful tools and entry points for getting started. Beginning to read in Japanese may seem like a huge hurtle to clear for anyone who’s ever held an entire Japanese novel in her hands, and I’m not going to promise that it won’t be difficult, especially at first. It’s not impossible, however, and it can even be enjoyable. I think that, at an absolute minimum, one needs two full years of college-level Japanese before it makes sense to start reading Japanese language texts. There are two primary reasons for this. The first reason is that it takes about two years to become comfortable reading the Japanese scripts as they appear on a page. Basic reading skills, such as figuring out where words begin and end, figuring out who is speaking, and figuring out how to look up unknown words, will be unavailable to a student who doesn’t have two years’ worth of knowledge of kana usage, kanji, and grammar patterns. Without these skills, the characters printed on the page are just so much linguistic slurry. The second reason one needs two years of Japanese is that it takes about that long to develop a familiarity with the way the Japanese language works outside of an artificial environment (such as a classroom or a textbook). In Japanese, as in English, writers abbreviate words, leave out words, make up words, use words in strange ways, bend the rules of grammar, and do fun things with dialog and dialect. These are not the sorts of things one can look up in a dictionary, so one needs to know the rules well enough to identify which rule has been broken. Both reasons I have given are really the same reason – literature is high level writing, and one needs to accumulate experience with the language in order to understand it. There are obvious benefits to enrolling in college level Japanese language classes, but I realize that not everyone has the necessary resources to do so. Thankfully, there are some excellent textbooks on the market that make self study easy. My absolute favorite is the Genki series, which comes with a matching set of workbooks. The main benefits of the Genki series are that it is ergonomically formatted, it teaches vocabulary and grammar in a well organized and easily digestible manner, and it contains reading passages and practice drills that help you use what you’re supposed to be learning in the most efficient way possible. I also think the Genki series tackles the challenge of learning to read written Japanese in a superlatively intelligent and user-friendly manner. The Genki series neither gives you too much information (like an expensive hardcover textbook such as Yokoso! does) or too little information (like a popular study guide such as Adventures in Japanese does), and it also integrates grammar and vocabulary seamlessly into speech patterns and the written language, unlike mass market texts such as those created by companies like Berlitz and Rosetta Stone. The two Genki books will teach you the rules of Japanese; and then, once you’ve mastered these rules, you can go on to the next book in the series, An Integrated Approach to Intermediate Japanese, which will teach you how to apply the rules to real conversations and reading material. In whatever way you choose to study, it’s good to have those two years of Japanese language experience under your belt before you start trying to read real texts. Of course language learning ability differs from one person to the next; but, if you have less than two years of experience, attempting to read Japanese is more than likely going to be an exercise in frustration. I think the problem most people have, however, is not diving headfirst into real Japanese, but rather waiting too long to get their feet wet. I don’t think there’s any real need to wait until you’ve learned all the grammar points or all the kanji before you start reading – all you need is the right set of tools. As with many realms of study in the twenty-first century, the most useful tools available to you are digital, and the foremost of these digital tools is the internet. As wireless internet access is not available in all times and all places (especially in Japan), however, it’s always good to be in the possession of more concrete tools as well. The single most useful tool available to someone moving past the initial stages of Japanese language study is a denshi jisho, or electronic dictionary. A denshi jisho will include a wide range of dictionaries, including the Genius series of English/Japanese and Japanese/English dictionaries. (Models with dictionaries for other languages, such as French and Chinese, are available as well.) Denshi jisho will also, without fail, include a Japanese dictionary, which is like a combination of a Japanese-language OED and an illustrated encyclopedia that may include sound (just in case you need to know the difference between the calls of two species of crickets, for example). 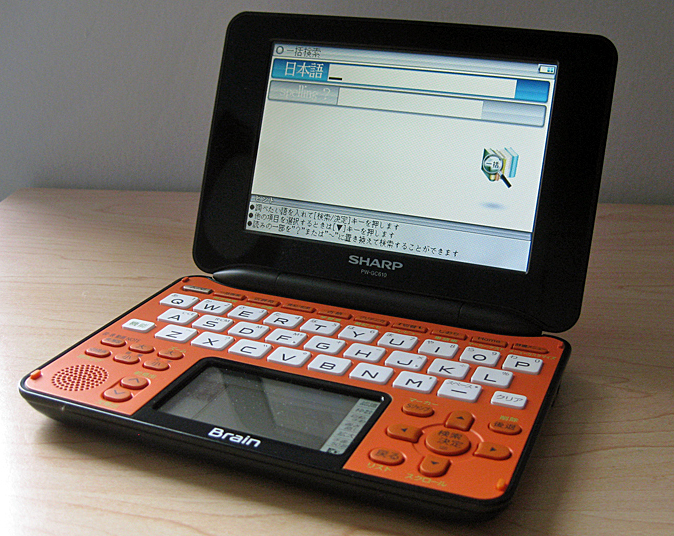 Electronic Japanese dictionaries come equipped with a feature called gyaku-jibiki, which allows the user to search for a word by its last character instead of by its first, as well as many other search tools that accommodate the difficulties involved in figuring out how any given kanji is read. If you don’t know a word in any of the entries you’re reading, most denshi jisho have a “jump” feature that allows you to highlight a word on the screen and then go to that word’s entry in any other dictionary available on your machine (including the Japanese/English one) before returning to the original entry. This is useful if, for example, you’re using one of the more specialized dictionaries available on your denshi jisho. Depending on the model you choose, these specialized dictionaries may include a Classical Japanese dictionary, an encyclopedia of Japanese history, an index of Japanese poetry, a dictionary for katakana words and onomatopoeia, a dictionary for four-character phrases, a botanical reference guide, and so on. One of the most useful features of any denshi jisho is its kanji dictionary. Learning to use one of these things is a cultural and linguistic experience in and of itself. If your model has a stylus and a trackpad, all you need to do is to write the character – these pieces of equipment have better handwriting recognition software than iPhones and Wacom tablets. If your model doesn’t have a trackpad (and many of them don’t), there are still plenty of plenty of ways to look up kanji, the most useful of which is by a combination of radical and stroke count. Once you find the character in the dictionary, you will turn up a wealth of information, including how it pronounced, a list of words beginning with and including the character, a brief etymology and a Chinese pronunciation guide. Once you get used to your denshi jisho, searching for kanji becomes quick, easy, and painless. No paper source in existence can compete with a digital kanji dictionary. Denshi jisho can be purchased at any electronics store (and many large bookstores) in Japan, but they’re harder to come by abroad. If you live near a major urban center, Japanese bookstores (such as Kinokuniya) will generally have a selection of denshi jisho on display. You can also order one through Amazon.co.jp, whose restrictions on shipping electronics overseas doesn’t apply to these devices. The two most common brands are Sharp and Canon. There is a greater difference between individual models than there is between the two brands as a whole, but lower price range Sharp models tend to be more technologically sophisticated (with trackpads, color screens, auditory pronunciation guides, and embedded video), while most Canon models have an English language menu setting and touchscreens (which is great for highlighting words and “jumping” between dictionary entries). If you don’t want to invest in a denshi jisho, there are many excellent resources on the internet, one of which is a site called Denshi Jisho, which features a great kanji lookup system. My personal favorite online Japanese dictionary is Jim Breen’s WWWJDIC, which will return tons of entries and example sentences for any search, including searches for internet slang, English-derived portmanteaus and other neologisms, and onomatopoeia so obscure that they don’t appear in Japanese dictionaries. If you’re in the habit of reading Japanese online, a popup browser plug-in called Rikaichan can define any text you highlight in your web browser (although it doesn’t always work so well with Flash-embedded text). I am given to understand that there are also many types of tools available on the iPhone and the iPad. I don’t have enough experience with either of these devices to make recommendations, but a quick search on Google will turn up dozens of lists and reviews. Speaking from an almost complete lack of training in linguistics, I can confidently say that some types of language are more difficult to read than others. As it just so happens, however, the types of language that you’re interested in are going to be much easier for you to learn to read than the types of language you’re not interested in. What this means is that, once you’re ready to read, it’s not necessary use “training wheels.” If you’re interested in reading mystery novels, read mystery novels. If you’re interested in reading manga, read manga. If you’re interested in reading novels by Kawabata Yasunari, read novels by Kawabata Yasunari (they’re actually not that difficult). I don’t mean to suggest that one can simply pick up a book and read it. What I am trying to suggest is that there’s no need to slowly work your way up through material of increasing levels of difficulty until you’re finally able to read what you actually want to read. You don’t need to slog through fourth grade level readers or collections of fairy tales written for children if you think stuff like that is stupid and boring. You don’t have to muddle your way through the confusing layouts and endless notes and vocabulary lists of “Japanese-English parallel text” books like Reading Real Japanese or Breaking into Japanese Literature if you don’t want to. You shouldn’t feel the need to start with something “easy” like the Japanese translations of the Harry Potter books (which aren’t actually that easy, as it turns out). These sorts of preparatory exercises really aren’t necessary. That being said, some books are easier to read than others. Even among manga titles by the same artist that all use simple vocabulary and furigana, some are going to be easier to understand by virtue of good editing and solid storytelling. For example, Ōkubo Atsushi’s popular shōnen series Soul Eater is much easier to read in Japanese than his debut series B. Ichi. The same goes with literature. To offer an example from my own experience, the first writer I tried to read in Japanese was a nightmare until I figured out that what she wrote in the sixties is infinitely easier to read than what she wrote in the eighties. Before I was able to arrive at this conclusion, however, I gave up on her altogether in order to read another writer writing at the same time on roughly similar themes using much simpler vocabulary and sentence structures. The point I’d like to illustrate with these examples is that there’s no shame in giving up on something difficult in order to search out something easier. Reading in Japanese is not about punishing yourself or training yourself through hardship; it’s about experiencing the pleasure of becoming immersed in something you enjoy. You shouldn’t be hunched over a desk with a dictionary and a notebook; you should be chilling out in the bath or in a hammock in your backyard. Unless you’re preternaturally brilliant, you’re going to go through an awkward stage in which you make embarrassing mistakes in interpretation and can’t read more than two or three pages at a time. The progress you’ll be able to make during this awkward stage shouldn’t be underestimated, however. You’ll learn things about the Japanese language that you never would have learned in a textbook, such as how to appreciate the nuances of word choice and the subtle differences in writing styles. Reading a page at a time will turn into reading two pages at a time, and two pages will turn into three pages, and three pages will eventually turn into just one more chapter, which will eventually turn into I am not sleeping until I finish this. I wrote this guide as a response to the email I’ve gotten from people asking for advice on how and where to start reading. By suggesting that “you can start wherever you want,” I’m afraid that I didn’t offer the concrete suggestions that perhaps these people were looking for. If you would like a concrete recommendation for where to start reading, I will confess that I find the work of Murakami Haruki and Ogawa Yōko to be consistently easy to read. Their language is clean, their stories are engaging, they both have published plenty of work of variable length that has yet to be translated, and an English speaker should be able to understand the vast majority of their idiom and imagery. Manga is also wonderful because you can actually feel yourself turning the pages. Some manga is surprisingly difficult to read, however. A good way to check out the difficulty level of a manga before you buy it is to enter the manga title into Google along with the expression 立ち読み, which should turn up several Flash-based previews. There are also many publisher websites that provide free samples and serialize content online (for example, I’m a fan of the series posted on Tora no Ana’s Comic Holic site). In addition, the JManga website, which is now (mostly) global, offers the reader the option to toggle between the translated English versions and the original Japanese versions of its titles. In the end, though, it really comes down to personal preference. If you enjoy reading something, you’re that much more likely to put effort into reading it. Just don’t let yourself be daunted by the prospect of reading Japanese! It really does get better. I really enjoy your blog. Keep up your nice work. I can only read in Japanese some haikus and that is with the help of thick kanji dictionaries. My dream is to be able to read all of Akutagawa Ryunosuke stories and more novels from the 20th century. If you want to hear the Japanese you are reading, plus an Americn English translation, go to nacos.org and look up the section on “radio”. There is also a similar feature for selected haiku poetry. Thank you so much for this post—I’m going through a bit of a rough patch, almost solely due to my Japanese reading level, but this has given me the confidence to keep on track (and by “track” I mean “everything ever written by Kurahashi Yumiko). And, hey, looks like I’m going to the IUC this summer, so that’s a good an opportunity as any to really throw myself into this language fulltime! 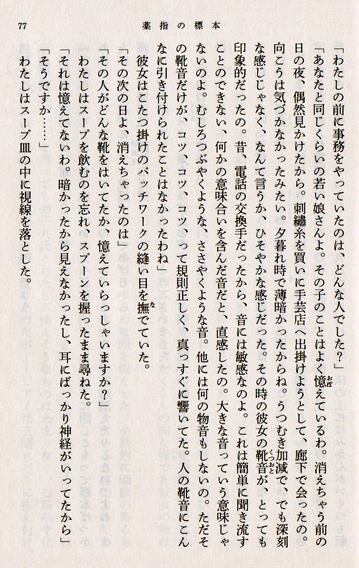 Nice blog and nice essay about reading Japanese in the original language! My forays into this began with “translating” popular Japanese songs. Well, a song, that is, one by Mori Shinichi. I thought it was very strange, because the first line was (in my translation) “May I please have a pillow.” And it was supposed to be a sad, sad “enka”-type song. I showed the translation to my Japanese language teacher who smiled the equivalent of a belly laugh and said it should be “Oh, please, my dear mother!” She suggested I start with Peanuts cartoons, which are widely translated and available, so I could see how colloquial English is transLITERated (there is a difference) into Japanese. It helped a lot. The other thing that helped was living in Japan for 5 years . . . and then marrying a Japanese lady. A very literate one, at that! Best of luck to you !! PS: It is a life-long, full-time endeavor, and full of fun! I set this post aside because I’ve been meaning to reply to it for some time now. You have justified my entire existence as a student, when I was studying Japanese and the other foreign language students (studying Spanish, Italian, French and so on) would laugh at me for not being able to read more than a couple of pages of a contemporary novel without a dictionary. And yes, I am that old that this was in the days before Denshi Jisho, when you had to look everything up by hand and I would carry a thick kanji dictionary with me everywhere and be gesticulating wildly in the air to count the number of strokes. I love this entry! I took up Japanese as a language elective course in college, but the Kanji intimidated me. I’ve just recently begun to pick up where I left off and I’m so happy I found the Genki course online 😀 It was what I used before, and it really was/is effective.